Made this up a couple weeks ago. Just had to wait till I had the Yak out to take pics. Was very simple and cheap. I cut the PVC down to just over 7 1/2 feet. If I put some type of rubber cap over the end of the ubolts inside the tube and put caps on the ends, I can use them as rod storage when traveling. My arms are thin enough that I could reach inside the PVC to get a ratchet wrench on the nuts of the ubolts to tighten them, so I did not need to drill a hole in the top of the PVC to put an extended ratchet down to tighten the nuts. I was originally planning to add an 2 extra nuts and bolts in the open holes of the metal brackets for more security. I still may do that. 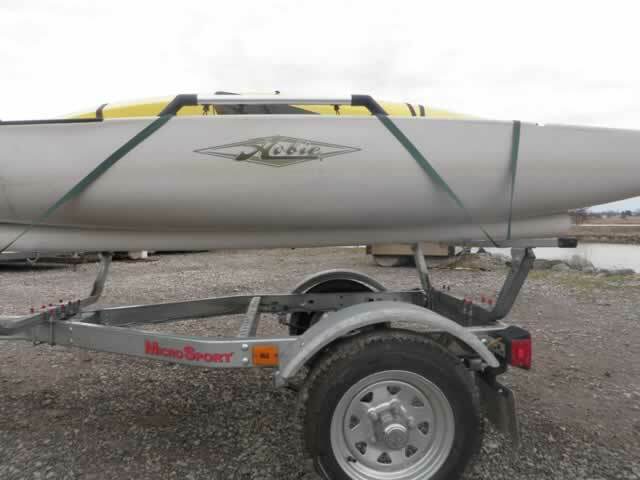 It is good and solid, I can sit in the kayak on the trailer. It should prevent any deformities to the hull. Was going to use 2 inch PVC like another member posted, but then I would have needed a riser to make it high enough to the hull didn't hit the trailer. Then a buddy suggested using the tubes for storage and going to 4 inch. Should be no problem to rig up caps that lock. Had the first test run yesterday and it worked like a charm. 3 hours to the fishing hole and back, kayak was stable the whole time. Here it is with the kayak on it. Thanks for sharing a hug. Plastic boats are best supported longways, along the scupper line. Well done. I do have one thought/suggestion/question. If the span between the crossbars in say about 5-6 feet, will the PVC start bowing/warping a little after time? I wonder if a support on the pipes about mid point would help. Then again replacing the PVC runners would be pretty cheap and easy to do, so it's probably not much of an issue. I had thought about that too. It would be very easy to brace them at the mid point. There is so much room under the yak that I plan to put some kind of storage container for life jackets and gear in that space. I do want the pvc pipe to bend so that they contour to the shape of the hull, but I definitely could support them in that position. Will see what happens over time. Sure was a lot cheaper than saddles and gives way better support. I have the same thing on top of my 97 suburban. I think it it works great. You did a good thing. De-tension, thanks for this valuable post. Prior to seeing it, I was feeling comfortable with my current solution of Yakima cradles sitting on top of the same Malone trailer. I just bought this set up and a Hobie PA a week ago. I live in Texas - it's hot. I'm now wondering if the standard Yakima cradles bring too little surface area to the hull and if the boat will warp this summer. I've eye-balled it several times and the boat sits up nicely on the cradles, but I suppose warping is a gradual process and what I see doesn't mean much. So, I guess I'm asking...do you, or does anyone, have an opinion on standard Yakima cradles getting the job done for longterm storage? I don't really have enough space to put the PA on the floor of the garage b/c the trailer takes up that space now. But I could probably get it up on its side against the wall if necessary. I don't love this option b/c it's more on/off the trailer than I'd like. It's nice having it loaded up and ready to go. never mind -- I just checked the boat sitting on top of the Mako saddles from Yakima... After only 2 days they already have hull indentions. I moved the boat off the trailer onto its side on top of a carpet for now. This answers my question - I cannot use the Mako saddles for storage. I plan to take them off and implement your PVC solution. Wish me luck. Yes the saddles will put indents into the hull of the yak. 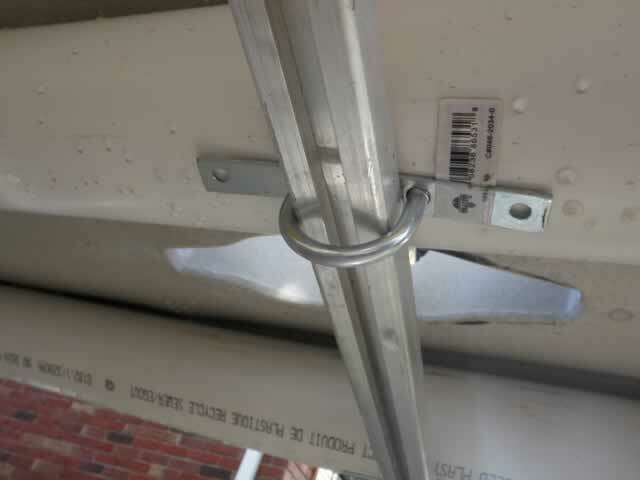 As long as your arms are not too thick, you should be able to reach in to tighten the bolts inside the pvc tube. I just put everything together loosely, then put the kayak on and made sure I was happy with the placement, then tightened it in place. It is not difficult. You will need a drill and it helps to have an extra pair of hands. I kept the tubes long in case I wanted to put caps on them to store rods. 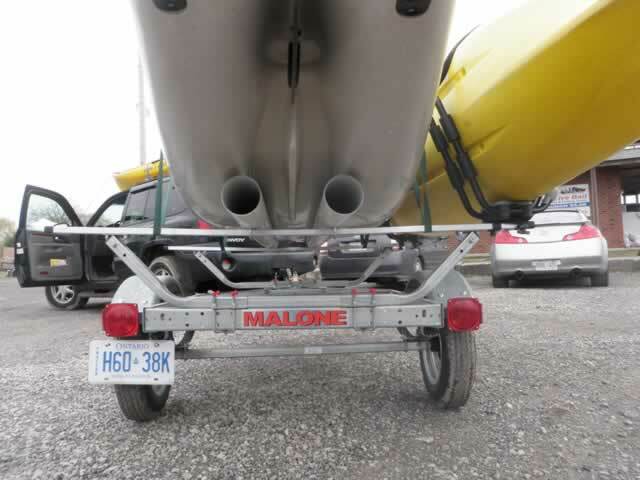 I can sit in the kayak on the trailer and it is no problem. If the dents don't come out on their own, I have heard that if you tape a black garbage bag over the dents and leave it in the sun, they will pop out. I haven't tried it yet tho. Where abouts in Texas? My sister is just outside Amarillo so I try to get down to visit her. I would love to come down and do some fishing on the coast sometime. Good luck, you should have no trouble. PVC is too thick, it will break. Use pression PVC ( deep grey ). Your Pro-angler is very high on the trailer, what advatage? Thanks for starting this thread, after looking at these pix I decided to go the same way. Using pool noodles and small PVC on top of my regular bunks, as this cost nothing and took 30 minutes to make. It is actually drainage or sewage pipe. Had to go 4 inch as thinner didn't keep the hull of the yak high enough to be off the metal bars. 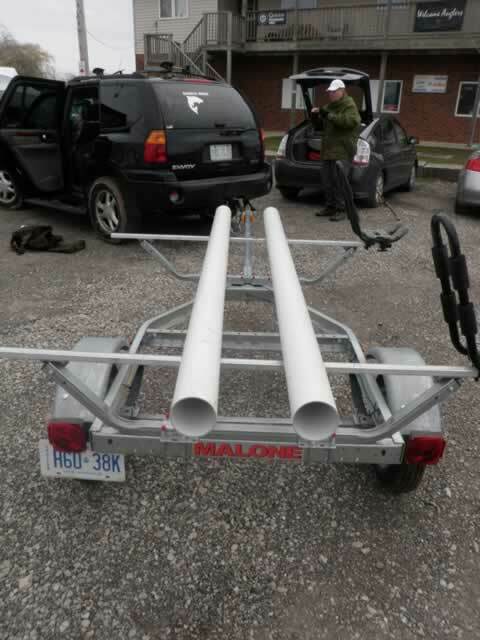 (could have used a spacer but figured the 4 inch might be good for rod storage) Didn't want that height on the trailer, it is just how it worked out. 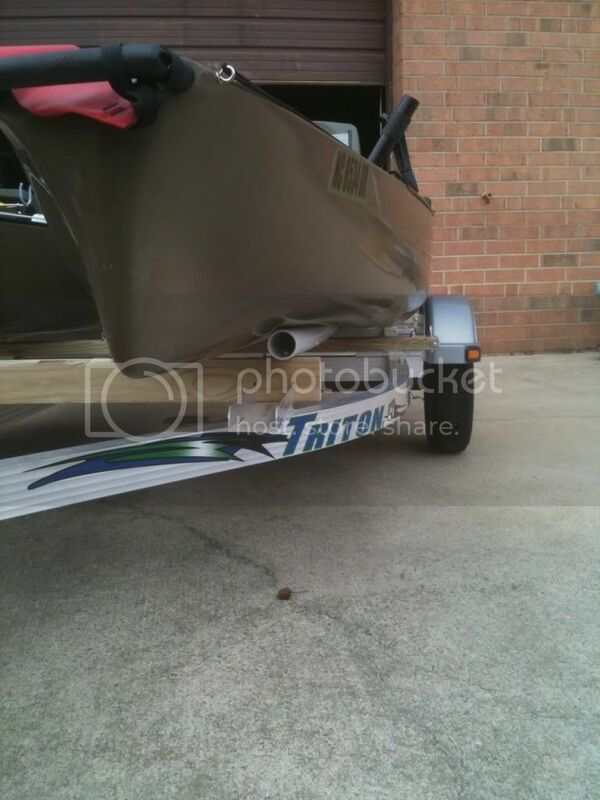 I suppose I could modify the trailer so the yak sits lower. That was how the trailer was when I got it. Other thing I have been considering is putting a storage box in the space below the PA to put life jackets etc. I use 63 mm (2,50") diameter and it works. The indentions popped out on their own in a few hours, so all good there. 1. Did you say in your original post that you cut the pipes down from 10 foot to 7.5? I ask because you mention directly above that you intend to put rods in them, and most rods are know of are 8-9 feet. 2. What do you make of the comment regarding thickness of PVC and its likelihood of cracking, compared to the poster's recommendation of "pression PVC". I googled it but only came up with French websites, so not sure what to make of that. 3. We live in Austin, TX. I grew up vacationing on South Padre Island, but I haven't been back since I got serious about fishing. I definitely plan to fish the flats for reds with the new PA.